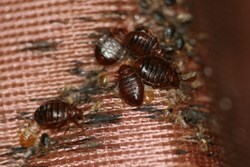 The increase of bed bugs in Arkansas was reported the highest this year. In response to it, My Cleaning Products suggested a pesticide-exempt product to help the residents. Bed Bug Bully is different from most of the bed bug sprays. Unlike them...it is made with organic ingredients. The rise of bed bugs in Arkansas was determined the highest this year among all the other states. And wanting to help its residents, My Cleaning Products then suggested a pesticide-exempt bed bug spray to safely kill the pests. A post from katv.com published on December 03, 2013 stated that it was a report from a pest-control company that identified Arkansas as the state with the biggest rise of bed bug calls since last year, My Cleaning Products shared. Particularly, the increase was said to be almost 50 percent. The majority of the calls, according to the report, were from residences, MCP relayed. And according to a personnel of the pest-control company that revealed the increase of the critters, the fact that there are more travels these days was one of the probable reasons behind the rise of the pesky creatures. Below is a part of the post Bed Bug Rise Highest in Arkansas by My Cleaning Products. “Ever since their return, bed bugs had been rising. However, this year, Arkansas was determined as the state with the highest increase of them. My Cleaning Products said that indeed, bed bugs had become more prevalent. And because of that, it stated that everyone must now be even more careful of their presence. Besides taking preventive measures, MCP stated that the public must also be ready to kill bed bugs quickly as anyone could now pick them up anywhere. That way, one could prevent them from multiplying and causing even more problems, it said. To be prepared to eliminate those critters promptly, MCP cited that one must particularly need a bed bug spray. Nonetheless, it said that a person must be keen with his or her choice as many of the products for those pests contain harmful chemical ingredients. But as it said, Bed Bug Bully is different from most of the bed bug sprays. Unlike them, it pointed out that it is made with organic ingredients. Being a pesticide-exempt, it added that EPA had also added it on its FIFRA 25(b) list. Moreover, My Cleaning Products stated that hotels, hospitals and pest-control companies had proven that it efficiently kills bed bugs and its eggs. And with those advantages, it asserted that it is truly the best and even encouraged everyone to prove it themselves via the Bed Bug Bully Complimentary Samples. It shared that they are available at MyCleaningProducts.com.